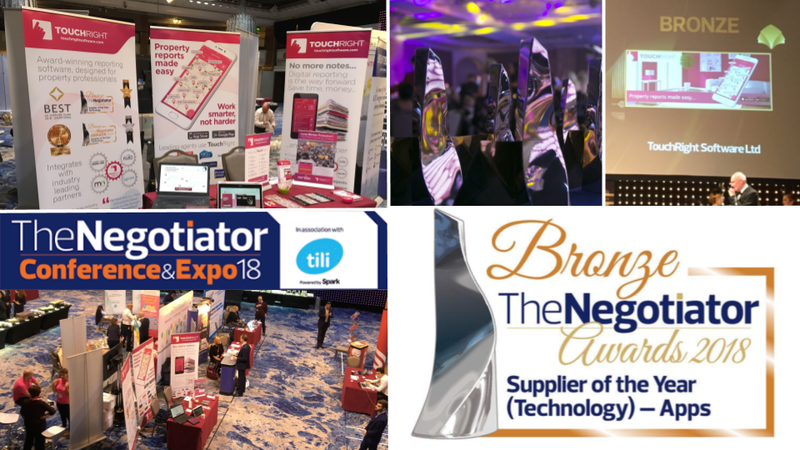 Wow, what a fantastic and extremely busy time we had at the 2018 Negotiator Conference Expo and Awards! Situated in the grand surroundings of Grosvenor House, Park Lane in the heart of our capital city, the event attracted hundreds of delegates representing the residential property industry from around the UK. The TouchRight exhibition stand was well placed in the heart of the conference and expo, surrounded by a range of friendly industry suppliers showcasing their property management solutions. We were delighted by the positive response to our new Lone Worker Protection feature, and it was great to catch up with our integration partners to discuss ideas and plans for next year. We also seized the opportunity to attend a few seminars to gain a deeper insight into the key issues facing agencies at present, so that we can continue to support them and help them stay ahead of the game in 2019! As the daylight faded, the party really started with the glitz and glamour of The Negotiator Awards. It really is the property party of the year, with an extra large dose of laughter thrown in, generated by this year’s host, Julian Clary. We were very lucky to share a table with the team from Life Residential, Portico Lettings and Propology Boutique. We were also over the moon to be awarded ‘Bronze’ in the Supplier of the Year: Technology (Apps) category. It’s great to receive industry recognition, especially as the 2018 entry list was the biggest in the history of the Awards. It’s also testament to the hard work and dedication of the TouchRight team! ← TouchRight Tips: Compile property reports without even typing a word!